Can you believe summer is here? We’re kicking things off with our seasonal challenge using purple glass and acrylic beads. It’s been years since I’ve worked with beads and needless to say this was truly a challenge. I was all over the place with what I was going to make, something about clay pots was kicking around in my head and the idea transpired from there. With this challenge we team up with a few new bloggers and I can hardly wait for you to see what everyone created. This is a talented group of ladies! Karen at To Work With My Hands hosted, she’s super sweet and an absolute joy to work with. I’m so blessed by her friendship. Let’s begin with my project, it started with a simple pack of beads. Beads came from Hobby Lobby by In Bloom by Bead Design. They come in all sorts of other colors too so get creative with your selection if you decide to duplicate any of these projects. The additional supplies can be purchased at any craft store or online. The first step is to apply the fabric swatch with mod podge glue. This is easy because you don’t even need scissors if you’re working with pre cut fabric. Lay the fabric face down. Cover the back with Mod Podge Glue. Turn the pot upside down and apply in the shape of a diamond. Carefully fit it to the pot, make sure to remove any bubbles or creases. Then flip the remainder fabric over to the inside. 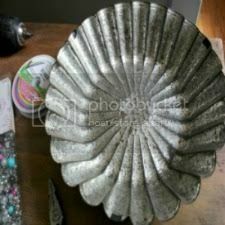 For any loose edges just add a little more glue and set pots aside to air dry. Wasn’t that easy? We’re making a bead swag assembled with floral wire. The first thing I want you to do is establish a bead pattern. I really liked all the different styles of beads in this pack, it allowed for some creative ideas. Cut one 2.5 ft. of wire and fold so it looks like you have two 25 gauge wires, this wire is easy to bend. 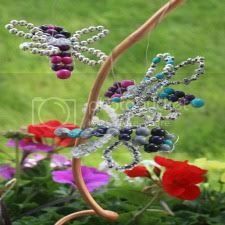 We need to double it because it can also snap with too much twisting; I like it because it’s delicate and easy to use. 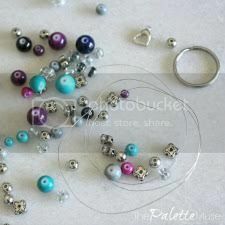 Before you add the first bead make sure to create a loop at the bottom so the beads don’t fall off. 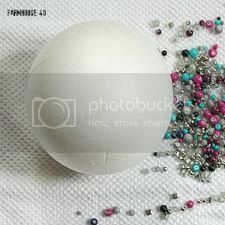 Add each bead one by one until you have a full foot. 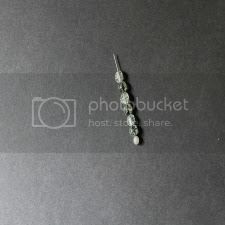 You may prefer having wire showing between the beads, so leaving gaps may be something to think about. Simply have fun with it and make it your own. Once the swag is completed it’s time to add it to the pot. We do this by taking the loop end and fitting it over the rim towards the inside and then wrapping the swag around the pot and locking everything in place. Then connect the remainder wire through the loop and additional wire can be clipped off or twisted back through the swag. 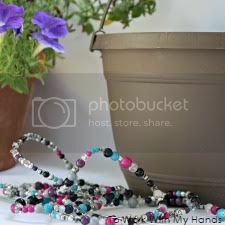 Once the clay pots are finished it’s time to figure out what you want to do with them. I filled mine with a few plants to enjoy on the picnic table through summer. I added additional swatches and rocks for interest and after stepping back to view this trio of clay, fabric and beads I was ready to sit down and enjoy. This turned out to be a neat spot for an early morning breakfast before the extreme heat arrived. 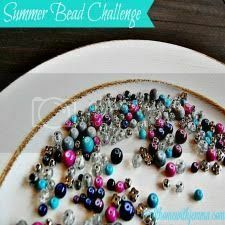 Hope you’ve enjoyed my bead challenge now I’d like to invite you to visit my creative friends, wait till you see what they made. They’re going to knock your socks off.